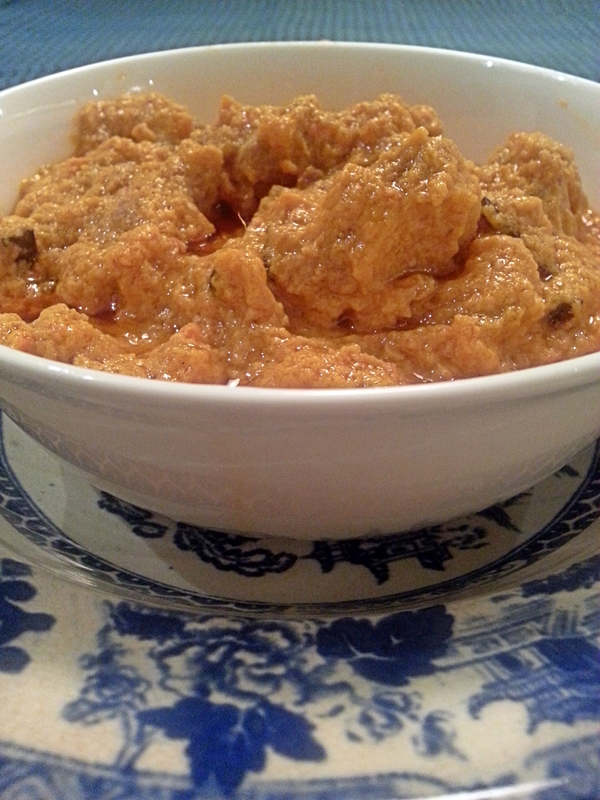 I love red meat and i wanted to try a new recipe, when i came across this dish in Anjum Anands cookbook – New Indian. Unlike the usual recipes for red meat curries, this is not very spicy. Instead it has this rich flavour which is deep and harmonious. The recipe is originally from Lahore, and was exactly the ‘new’ i was looking for. Using a blender make a fine paste of the ginger and garlic, adding a little water to help. Keep aside .In the same blender jug puree the tomatoes with the yoghurt. Heat the oil in a large non-stick pan and add the whole spices and bay leaves. Let them sizzle for a few seconds , then add the ginger and garlic paste. Cook over a moderate heat for 5-7 minutes ( keep stirring on and off), then add the yoghurt and tomato mixture, the red chilli powder and give the pot a good stir . Bring to a boil and add the lamb and salt Cook over a low heat until lamb is tender, around 45-50 minutes. (Keep stirring on and off don’t let it stick to your pan). Remove the lid and turn up the heat ,toss and turn the meat in the thickening gravy it will add a lot of flavour and depth to the curry. If you feel that your gravy is too thick add enough water (boiling) to make a creamy gravy. Serve with plain boiled rice or mint and onion flat bread.